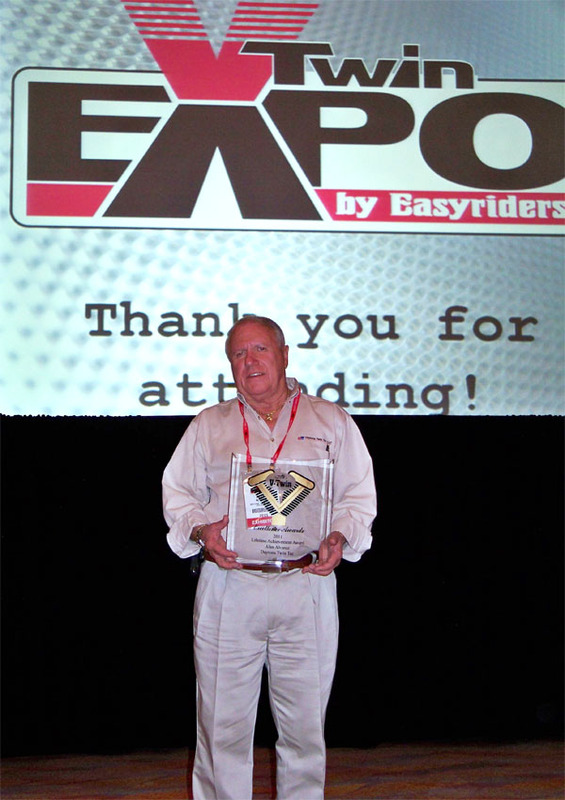 Our Chief Operating Officer, Allen Alvarez, was recently given a Lifetime Achievement Award by Easy Riders Magazine in recognition of his almost 40 years involvement with the motorcycle industry. Allen started his career in the motorcycle industry in 1970 officiating motorcycle road races, during which time he met some of the early pioneers of the motorcycle distribution business. During the mid 70s as a commissioned road rep he helped Sullivan Distributing, Nempco and Leman’s develop their dealer businesses in Maryland, Virginia, West Virginia, Western Pennsylvania and Eastern Ohio. In 1979 he helped Accel Ignition develop their motorcycle program and continued on to help pioneer the motorcycle distributor programs for some of the top brands in the business, including Russell, Cometic, Standard Motor Products, Edelbrock, Crane Cams, Permatex, and Mothers Polish. In 2001 he decided that it was time to start his own company, Daytona Twin Tec, which has become a multimillion dollar business in a short period of time and is the technological leader in its field. Today he is one of the best known and respected persons in the industry.